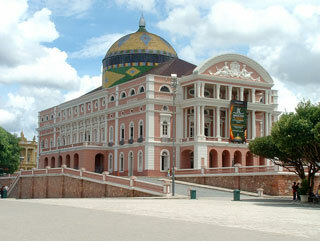 The Amazon Theatre (Portuguese: Teatro Amazonas) is an opera house located in Manaus, in the heart of the Amazon rainforest in Brazil. It is the location of the annual Festival Amazonas de Ópera (Amazonas Opera Festival) and the home of the Amazonas Philharmonic Orchestra which regularly rehearses and performs at the Amazon Theater along with choirs, musical concerts and other performances. This article uses material from the Wikipedia article "Amazon Theatre", which is released under the Creative Commons Attribution-Share-Alike 3.0 License.